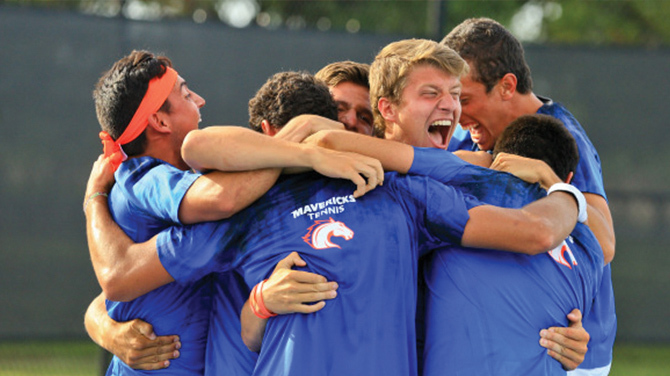 The men's tennis team capped a stellar season by winning the Sun Belt Championship in April, the seventh conference championship in program history. The team dropped just one match in the conference tournament in New Orleans. Defeating South Alabama 4-1 in the final, the Mavs completed their best record in program history with 18 wins. That decisive victory earned the team its first trip to the NCAA championship tournament since 2006. UTA was selected to travel to the Norman Regional to face No. 11 Oklahoma. As they did all season long, the players fought for every point. The Sooners took the match 4-0, but a tiebreak decided doubles, and all three singles points were battles down to the final match clincher. This year, the Mavericks return all but one member of their NCAA tournament lineup, as Carlos Arbiza graduated as the lone senior with an impressive career record of 58-48. The women's tennis team held serve in the 2016 season, going 11-0 at home in the process of running its home winning streak to 23 matches. Along the way, UTA knocked off big opponents on its home court in a schedule that tested the Mavericks in every match. This included a 4-3 victory over No. 45 New Mexico and a three-match sweep during a homestand that featured UT San Antonio, Memphis, and Metroplex rival SMU. The home stretch helped UTA finish with a 17-5 overall record and a No. 75 finish in the ITA/Oracle Division I Tennis Rankings. The 17 wins are tied for the second most in program history, one shy of the all-time record set in 2005. The fall portion of the tennis schedule began with the Midland Fall Invitational in September. "We have set the bar high," says coach Diego Benitez. "They really know what it feels like and how good of players they are. They are coming out there with a little more confidence and fewer nerves."